I adore competition, there isn’t much better than it. When it comes to sport competition become even more of a drug, even if it’s me and my brother trying to guess the attendance of the Cardiff City matches for the past 3 seasons (1-1 overall, leading 10-4 this season)! 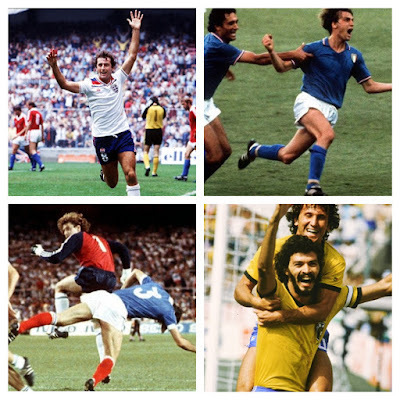 Then we look at football, the absolute height of competition worldwide. There have been days I've travelled 5 1/2 hours from Cardiff to Scunthorpe to watch us scrape a 1-1 draw with an 82nd minute equaliser, a rubbish game but superb day for one reason: the fans! There is something about a tiny attendance of 5000 of which 750 are City away fans making incredible amounts of noise that produces feelings not replicated by anything else any other sport has to offer. Separation amongst football fans is what differs us but not necessarily for bad reasons. For anyone who says anything other than football being the sport with the best atmosphere then they’ve never been to an away match where as a collection of like-minded supporters make up genius songs, sing your heart out and drive your team forward. I was at the Ashes 2009 first test in Cardiff when England hung on for a draw, amazing chants but nothing on football and I was at Cardiff Blues v Leicester Tigers in the Heineken Cup semi finals where it went to a historic penalty shootout but still nout on football! 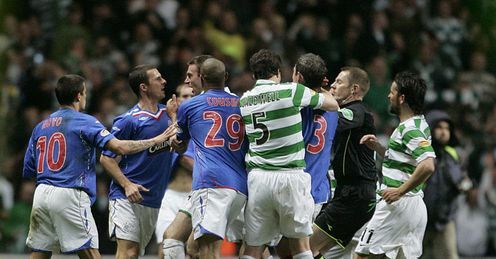 This brings us to, in my opinion, the best rivalry in British football, the Old Firm, Rangers v Celtic. This derby though, has been fraught with the ills of sectarianism from its beginnings leading us to ask when does a rivalry filled with “banter” become too much? Sectarianism is the divide and hatred that exists in areas like Glasgow between Protestants and Catholics, not much now connected to religion at all but just continued as it’s all that they’ve known. 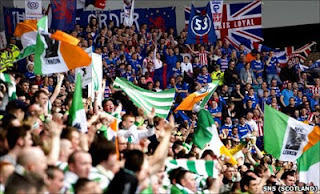 Furthermore it runs deep to the roots of people, Celtic at every game display the Irish flag as most of their support is of Irish ancestry while Rangers show the Union flag for their predominately British historic support. 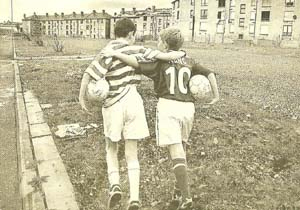 Glasgow in the mid 1800s became a sanctuary to many Irish Catholic immigrants, they adopted Celtic as their club with early success so along with the anti-Irish feeling, anti-Celtic feeling grew. 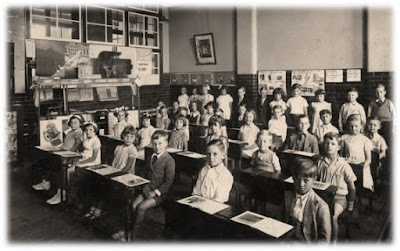 People who lived in Glasgow originally adopted Rangers as their protestant refuge and during the 20th century Rangers took on an “unwritten rule” programme of not knowingly signing Catholic players. This agreement stayed in place till in 1989 Maurice Johnston became their first major Catholic signing, it was further put in the past when in 1999 Lorenzo Amoruso became their first Catholic captain. While Rangers continually defended this standpoint, Celtic have had a number of legends who came from protestant backgrounds such as Jock Stein and Kenny Dalglish. We see the clubs themselves have had some sort of an impact but to get to the heart of the issue you need to look at the fans who live and breathe for their football club. The term 90 minute bigot was coined to explain the kind of hatred between the two sets of fans. This simply means for the 90 minutes of the game they will both sing inflammatory songs, wave their inflammatory banners and in some cases throw “missiles” at each other but ultimately outside football they don’t hate on religious grounds. Vice produced a documentary on this issue in 2012 (below, excuse the swears! ), it investigated violence and certain terrance chants as the Scottish government looked to enact legislation to try and curb (so called) sectarianism. During recent years the clubs have been working together with different groups like ‘Nil By Mouth’ to try and reconcile fans with Rangers in 2003 encouraging “Pride Over Prejudice” after Celtic launched “Bhoys Against Bigotry” and in 2007 Rangers issued the “Wee Blue Book” that contained a list of acceptable songs. This started as a harmless song but over time changed to include ‘Fenian’ which is a reference to Irishmen. I could’ve taken a Celtic song and looked at that too, both sides have their fair share of derogatory chants. But is this bad? Personally, and maybe I’m wrong, but I agree with those shown on Vice to laugh about them... They’re football chants, its harmless and only reflects the actual feelings of a minuscule amount of the population. Those who attend football matches weekly know that things get said and sung in jest as a unit that would never be repeated outside of the stadium. There of course are plenty of exceptions though where players are targeted with direct racial abuse for example. I am not condoning that in any way, it is widely accepted as disgusting in cases such as Christopher Samba having a banana thrown at him by his own fans. The issue is, what can be agreed as acceptable? Both Celtic and Rangers get wound up by the chants but when asked about it would say the Old Firm would be nothing without them. I say the same about the various sheep and Welsh references Cardiff receive, retaliation occurs but we love it really! The Scottish government were saved from taking any immediate action after Rangers' forced relegation to the Third Division in the summer of 2012 after massive financial troubles. For the next few years the two sides will only meet in the cup if at all and this is perhaps a required cooling off period. In 2011 police arrested Rangers fans who sent bullets and death threats to members of the Celtic staff. Now this is definitely too far, this is where the debate stops with the same going for when a heavily policed game spills into violence and street brawls. Glasgow street violence is often blamed on the Old Frim, the Vice documentary shows some cases of it and hooliganism/football casuals is something we’ll look at in other blogs. However trouble occurs in every derby worldwide, the Old Firm is no different. 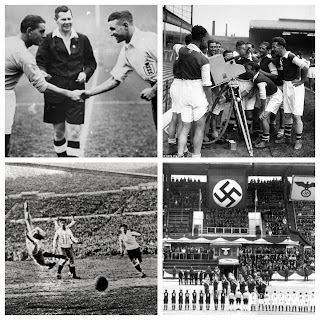 Do I think football related violence/racism is wrong? Of course. Do I think historically accepted chants/banners/banter should be banned? No. Football has character and is always much better for it, that’s why it’s unchallenged as the greatest sport with the greatest fans. The Billy boys harmless? Billy Fullerton the subject of the song was an anti Irish racist, a member of Oswald Mosley's fascist blackshirts and a strike breaking scab during the 1926 general strike...And to think the monkey's regard this sub human rat as some kind of legendary unionist folk hero. That's a fair point, apologies for not making it clearer. Billy Fullerton certainly wasn't harmless! A racist who went round beating people up, I meant the original Billy Boys Rangers song was more harmless. ... Yeh that's was the harmless origins, not Billy Fullerton!